In the following I want to examine the introduction of urban agriculture as a medium for gradual urbanization, collaboration and integration of new multicultural urban inhabitants, especially immigrants originated from rural areas. This essay after defining what is urban agriculture for todays urbanism, examines the terms multiculturality, transculturality, and multifunctionality in continuously productive urban voids and periurban areas. It also describes intercultural gardens in Germany, proposes the concept of transcultural gardens and presents three not yet realized projects in Greece. Urban agriculture is the cultivation of land inside or in the limits of an urban entity (intra-urban agriculture or peri-urban agriculture). It has two main necessities today: the production of food and the gradual urbanization of various minorities, mostly originating from rural areas, in order to adapt in their new home. In 40 years 80% of earth’s polulation will be urban citizens, a fact that is supposingly leading to urban poorness. Rural poorness is in fact a main reason of today’s economical migration. So we are coming to a dead end: what immigrants are now running away from, they are causing to a new location and setting. 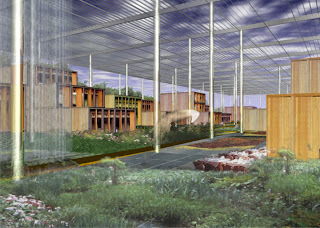 Urban agriculture is a sustainable development tool, though it presupposes the cultivation, management and distribution of a variety of foods, the use or the reuse of resourses, products and services that are found in the nearby area and the supply of this area with products and services (1). In these terms urban agriculture interacts with the urban ecosystem, uses the citizens as workforce, uses urban renewable energy sources (grey water, organic waste), has direct access to consumers, contributes to the urban green, and is influenced and directed by urban planning policies. Efforts have been done the last decades to bridge architecture and agriculture with designs for vertical farms, that minimize the urban land use. The aspects of urban agriculture are not only ecological and economical, but also deeply social, with the example of community gardens and intercultural gardens. Intercultural gardens began in 1995 in Goettingen of Germany where a group of Bosnian women from a refugee centre revived the orchard gardens of their home country. After the success of the first garden and the realization of a second one, an organization was formed in 1998 to manage and support these efforts. Now Germany has more than 100 intercultural gardens and the idea is adapted by other European countries. Gardens is considered a good typology for immigrants, though most of their knowledge is based in small farming and is not applicable in the German farming industry. These gardens provide a small piece for each user and a communal piece, usually with trees, for shared gardening and happenings. The intention, except from puttting down roots and gradually urbanising (from field to garden), is to exchange tips for gardening based on their background. The results include exchanging seeds send to them by their home country, exchange tastes and flavours and also offer new varieties and teach new technics to their new country. transculturality argues that the clash is productive. Interculturality tends to make different cultures “get on” with each other and understand each other. But still originates from the concept of the single culture as a sphere, a perfect accompliced product of society. In this way, one culture does not need another but to enrich itself or for fun. Transculturality represents the complexity of modern world, though it interprets cultures as a set of emergent components of one another. Cultures today is more than an exchange, is an interconnected system of ethics, an interactive platform of lifestyle norms, a hybrid field of mindstyle fashions. Transculturality is a positive response to the opposition to globalization, and a guarantie to diversity. In modern thinking transculturality applies in the fields of sociology and anthropology. I will show three projects that translate transculturality and urban agriculture into a device for urban planning. The first “ The forest, the hairdresser, his mother and a roof”, in Neapolis Larisa, Greece is a Europan winning project (E. Karanastasi, A. Fuchs 2003). The other two, “The cooking village” and “Urban fields” in military-camp of Markopoulos, Chania, Crete are projects of students of Urban Design in Faculty of Architecture of Technical University of Crete. (1) definition: Luc Mougeot, International Development Research Centre. It is officially used by UN-HABITAT Urban Management programme, FAO, CIRAD. (2) Welsch Wolfgang, Transculturality - the Puzzling Form of Cultures Today, From: Spaces of Culture: City, Nation, World, ed. by Mike Featherstone and Scott Lash, London: Sage 1999, 194-213.